These step by step instructions will guide you through everything that needs to happen with your hardware between the time you first open the box to the time you ring your first sale. Now that your hardware has arrived, it is time to set up your POS. An active internet connection & modem with one open port (not provided by Revel). At least 1 power outlet and 1 data port where you plan to install each POS terminal. If you need assistance setting up your system, Revel offers dedicated Client Success Manager (CSM) services. Our CSMs are fully trained Revel Point of Sale experts, available for on-site visits. They assist and train our clients to help them take full advantage of their Revel Point of Sale. To request a CSM appointment, contact your sales representative, or call 415-744-1433. 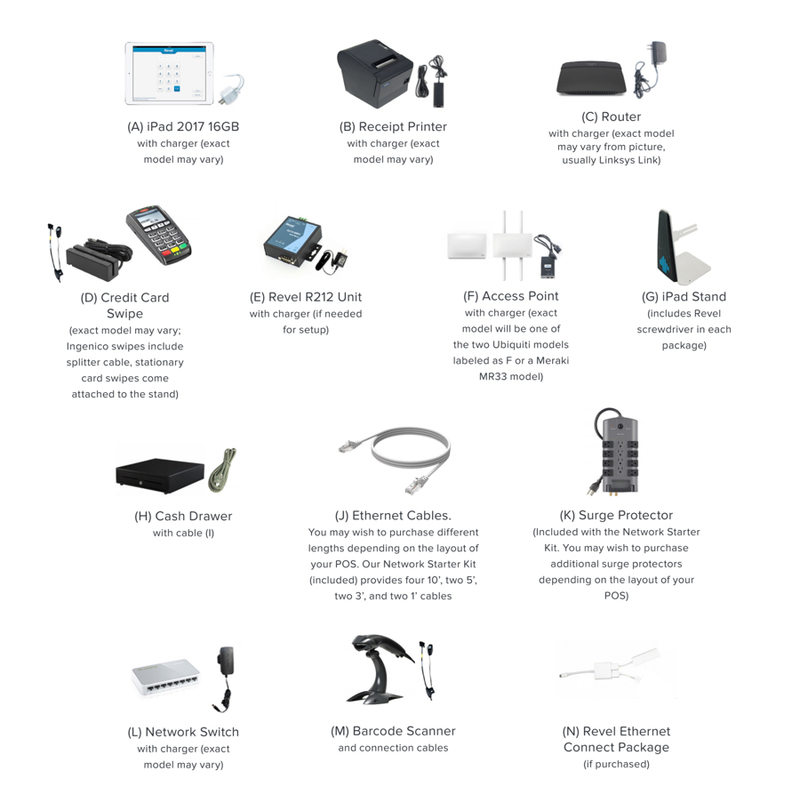 This guide will walk you through the setup of your POS terminal. When installing more than one terminal, repeat steps two through nine for each additional terminal. Use an Ethernet cable (J) to connect the router (C) to the modem supplying your Internet, then connect the router to power (C1), and place in the desired location. Install the stand (G) in the desired location and mount the iPad. Note: The stand either mounts onto a base plate, or directly into the counter. When mounting the stand into the counter (recommended), holes must be drilled before beginning step 2. 2.1: Place the stand upright. 2.3: (Optional) Using the circular key, unlock the pin on the pronged horizontal arm. 2.4: Slide the mounted iPad into the pronged, horizontal arm so that the screen faces towards the user, away from the arm’s mounting. 2.5: Push the pin back in to secure the iPad in place. 2.6: (Optional) Repeat steps 3-5 on the other pronged arm for the Customer Display Unit, making sure the CDU faces the customer. Place a switch (L) by where you will install the terminal or by the stand; connect to any of the blue ports on the router (C) using an Ethernet cable (J) and connect the switch to power. Note: The router can be used as a switch for one terminal. If no switch is being used, continue to step 4. Connect the iPad to power by connecting the lightning cable (A1) to the port on the iPad (A) and plugging the cable into the surge protector or an electrical outlet. If you purchased the Revel Ethernet connect adapter (N), connect the lightning cable to the adapter (N), which then connects to the port on the iPad (A). Connect an Ethernet cable (J) to the USB to Ethernet Converter. Connect the other end of the cable to the switch (L). Connect the iPad power cable to the surge protector. Note: The Revel Ethernet connect will only charge the iPad with the 12W charger or 29W charger for iPad Pro’s (5W and 10W will not be sufficient). Connect and place access point. Note: Exact model of the access point may vary. Only the outdoor access point comes with antennae. These antennae need to be attached to the access point. If you are using the Meraki access point, please also see the Meraki Install Guide. 5.1: Connect an Ethernet cable (J) to the LAN port in the power supply (F1) and to the switch or router (L). 5.2: Connect the access point power supply (F1) to power. 5.3: Remove the back cover of the access point and use a second Ethernet cable to connect the main port in the access point (F) to the POE port in the power supply (F1). Connect and set up the credit card swipe. IDTech do not attach to the new L stand. There is a separate holder for the IDTech swipes. 6.1a: Connect the Revel R212 (E) to power using the power supply (E1). Note: traditionally Revel R212 boxes are placed under the counter or otherwise out of sight. 6.2a: Connect the Revel R212 (E) to the switch or router using an Ethernet cable (J). 6.3a: Connect the credit card swipe (D) to the R212 (E). 6.4a: Then connect the credit card swipe to power. The power supply (D1) connects to the serial cable (shown below), not to the credit card swipe itself. 6.2b: Connect the power supply end of the splitter cable (D2) into the surge protector. 6.3b: Using the Ethernet cable (D3) connect the Ethernet end of the splitter cable to the switch or router (L). 6.4b: Connect the main adapter end of the cable (D1) to the Ingencio card swipe (D). 7.1: Place the printer (B) in its final location. 7.2: Connect the power supply (B1) to the printer and power. 7.3: Use an Ethernet cable (J) to connect the printer to the router or switch (L). Connect the cash drawer (H) to the printer (B) using the cash drawer cable (I). You will be able to distinguish the cash drawer model by the manufacturer’s label on the box. APG cash drawer cables are distinguished from Ethernet cables by having non-identical ends – one is smaller than the other. MS cash drawer cables ends are labeled for their appropriate end points, printer and cash drawer. 8.1: Plug the larger end of the cable (I) into the cash drawer (H). 8.2: Plug the smaller end of the cable (I) into the printer (B). 9.1: Connect the barcode scanner (M) to its serial cable (M1), and plug the other end of the cable into the serial port of the scanner’s R212 unit (E). 9.2: Connect the Ethernet cable (J) to the switch (L). 9.3: Connect the R212 unit to power using the R212 power adapter (E1). 9.4: Connect the scanner power adapter (M2) to the port located just past the coiled section of the scanner serial cable (M1). Once done, connect the cable (M3) to an electrical outlet or surge protector. 9.5: Screw the neck of the scanner stand into its base and place the scanner inside the stand. If assembling multiple terminals, repeat steps 2-9 for each additional terminal. Once your hardware is installed and you have completed your onboarding, you are ready to start taking transactions. If you have any questions, please call 415-744-1433 to speak with an agent.